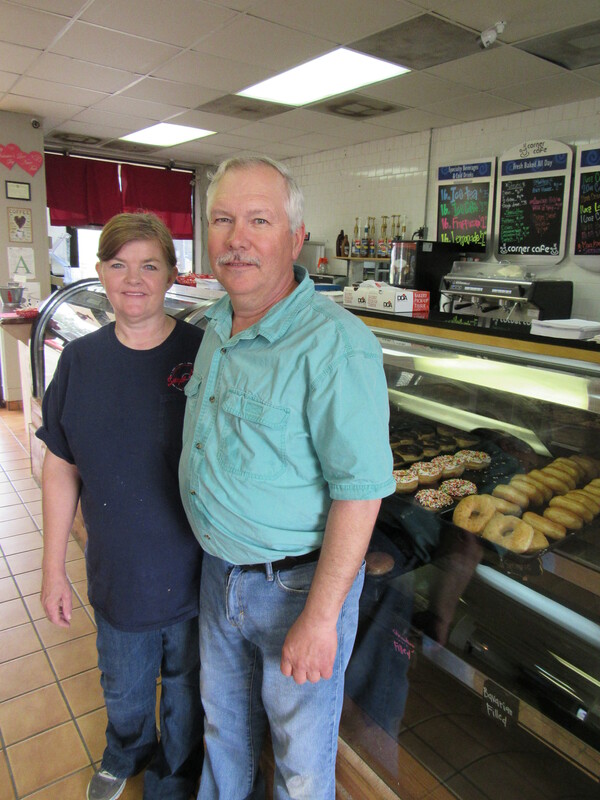 The Trice’s of Sugarland Doughnuts and More in Eupora have been enjoying every minute of their stress-free retirement adventure. It was in 2014 when the Trices’ made the move to begin to make their retirement business dreams come true. Steve has worked for Southeastern Timber Company in Ackerman for 38 years as a millwright/supervisor. Ann worked at Garan, Inc. in Starkville for 22 years, as a costing analyst/supervisor. Their son, Douglas Andrew Trice, manages a doughnut shop in Starkville. He loves his job and said it was a great atmosphere to be in each day. The family discussed the possibilities and began buying a few pieces of equipment. “It seems like God provided for us because if we needed something, we always managed to find it,” Ann Trice said. They practiced making doughnuts at home and allowed family, friends and co-workers serve as their “guinea pigs” –which they all loved, according to Ann – while they perfected their proprietary recipe. When they found a recipe that was both great tasting and satisfying, they began the process of creating a business model to develop efficient ways to make great-tasting doughnuts. Their proprietary doughnut bread recipe and the friendly staff have made Sugarland Doughnuts and More one of Eupora’s most talked about new businesses. Georgia Sisson (my sweet niece) received Easter Egg doughnuts from Sugarland Doughnuts and More from the Easter Bunny. At Sugarland Doughnuts and More, everything is made fresh daily. They also make their own icings and fillings. The doughnut line features glazed, chocolate, caramel, maple, cream cheese, sugar and cinnamon, chocolate and white sprinkles. Their filled-doughnuts line includes chocolate, white cream, lemon, cherry, apple, strawberry, blueberry and Bavarian Cream. They have old-fashioned cake and blueberry cake doughnuts. Their pastry line includes cinnamon rolls, cinnamon twists, Éclairs filled with chocolate, Bavarian or white cream, Maple Éclairs, apple fritters, cream cheese danish, as well as chocolate, blueberry and pumpkin muffins. Their sausage rolls are made with smoked linked sausage with American cheese wrapped in their homemade doughnut bread. They also feature sausage and biscuits each day. Customers love the variety of fresh doughnuts and pastries, as well as the friendly service. Leslie Frank had three important points that make her a fan of Sugarland Doughnuts and More. 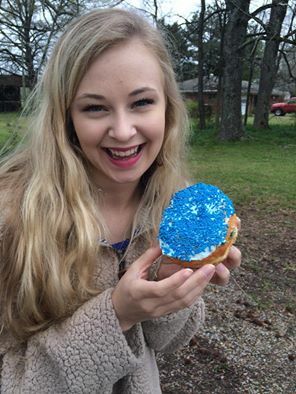 Stephanie Smith said her daughter Hannah loves the chocolate-covered doughnuts with sprinkles, and her youngest daughter typically buys doughnut holes. Betty Trice said she loves them all because the food is fresh, and she loves the owners like family, because they are her in-laws. “I love this place and the people are so nice,” Knight said. Randee Jernigan said she loves the consistent variety. Jernigan’s mom, Becky Johnson said she loves having the doughnut shop so close by and that her family loves the store. “I thrilled that Randee loves them, because she will usually share a cream-filled with me” Johnson said. Linda Kitchens said her grandson wants the glazed and chocolate covered doughnuts every time they pass by. Sue Salley loves the vanilla cream-filled doughnuts, while Beth Collum says the cinnamon rolls are the best! Cala Tabb said she loves the smoked sausage rolls and sweet potato muffins, while Katie Johnson said she loves the doughnut holes. Leah Herard said her oldest daughter loves the caramel doughnuts, while her youngest loves the doughnut holes. The coffee is fresh brewed each day and they feature six varieties including: regular and decaffeinated, Columbian, Dark Dakota, French Vanilla and Hazelnut Caramel. They also have an Espresso machine comparable to some of the larger coffee shops. They make create Espresso shots, lattes, frappes and cappicinos. They also have hot chocolate and fresh lemonade. A new product for Sugarland is the doughnut cake, a large doughnut that can be filled and topped with your favorite icing and sprinkles. All doughnut cakes must be ordered in advance. “It is long hours and hard work, but worth the rewards,” said Ann Trice. The store also features free Wi-fi, cable television, a dining area and lounge. “Please come in a enjoy a cup of coffee, read a book, browse the internet or simply just relax and enjoy the atmosphere,” Trice said. Sugarland Doughnuts and More is local at 47 Gwenn Ray Drive (next to Piggly Wiggly) in Eupora. For more information or to place an advance order, call (662) 258-3799. 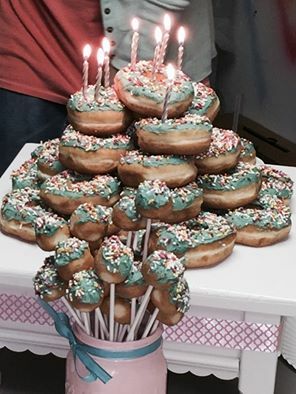 A doughnut cake and doughnut “pops” for a recent party by Jo Faulkenbery.